Mercury concentrations in tuna are increasing by nearly four percent a year, according to a new University of Michigan-led study, which suggests rising atmospheric levels of toxin are to blame. Researchers came to this conclusion using the findings from three previously published reports, which studied yellowfin tuna caught near Hawaii in 1971, 1998 and 2008. In the studies, scientists tested the tuna’s muscle tissues, finding that nearly all of the mercury they detected was the toxic methylmercury. As part of their reexamination of these studies, scientists included yellowfin tuna between 48 and 167 pounds and used a computer model that controlled for the effect of body size. In total, data from 229 fish was analyzed: One hundred and eleven from 1971, 104 from 1998 and 14 from 2008. The researchers found that mercury concentrations in the yellowfin tuna did not change between the 1971 and 1998 datasets. However, concentrations were higher in 2008 than in either 1971 or 1998. Between 1998 and 2008, the mercury concentration in yellowfin tuna increased at a rate greater than or equal to 3.8 percent a year, according to the new study. Mercury is a potent toxin that can accumulate to high concentrations in fish and pose health risks to people who eat large, predatory marine fish such as swordfish and tuna. 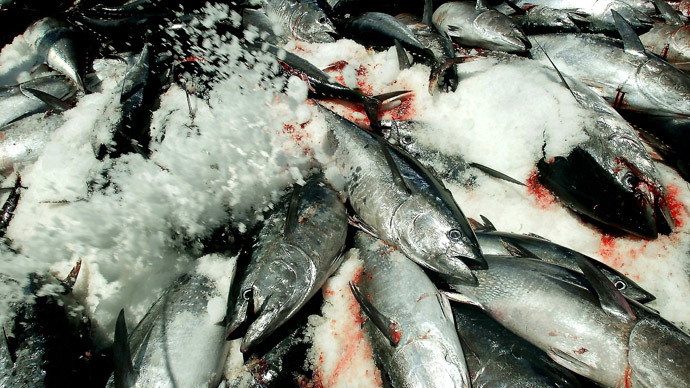 The US Food and Drug Administration and Environmental Protection Agency advises women of a child-bearing age, nursing mothers, and young children to avoid swordfish, shark and king mackerel, and to limit their consumption of tuna to 6 ounces per week. Consumption of large amounts of polluted fish can result in coronary heart disease and brain damage in children. The principal source of mercury pollution in the oceans comes from emissions from coal-fired power plants and artisanal gold mining. For decades, scientists have expected to see mercury levels in open-ocean fish increase in response to rising atmospheric concentrations, but evidence for that hypothesis has been hard to find.